On June 10, 1580, at the age of 56, Luís Vaz de Camões died, shunned by the nation he loved and penniless despite the acclaimed publication of his epic poem, Os Lusíadas, just a few years earlier. His death, on the eve of his country’s annexation to Spain, marked the end of a fated period in Portugal’s cultural history. It’s true that Camões did not reap the rewards of his talent during his lifetime but his masterpiece survived four centuries and is studied by Portuguese schoolchildren to this day. His long lyric poem, consisting of 1102 stanzas, is considered to be one of the most important works in Portuguese literature. More than any other writer, Camões extolled the spirit of the Portuguese nation in this fantastical interpretation of Portugal’s epic history and maritime exploration during the middle ages. His descriptions of Vasco da Gama’s mythic adventure toward unknown lands and the musicality of the Portuguese language form the basis of Os Lusíadas but underlying the heroic narrative there sounds a note of heartbreak and regret. Camões conveyed that profound sense of psychological and social anguish which dominates Portuguese culture to this day — but he also captured the passion and beauty of his nation like none other. Today, millions of people of Portuguese descent will celebrate Portugal National Day or Dia de Camões as it is known in Portugal. The Portuguese are currently experiencing a sense of anxiety and uncertainty about their future but I believe the adventurous spirit of the people — embodied so beautifully in Os Lusíadas — will help them overcome their country’s current economic hardships. 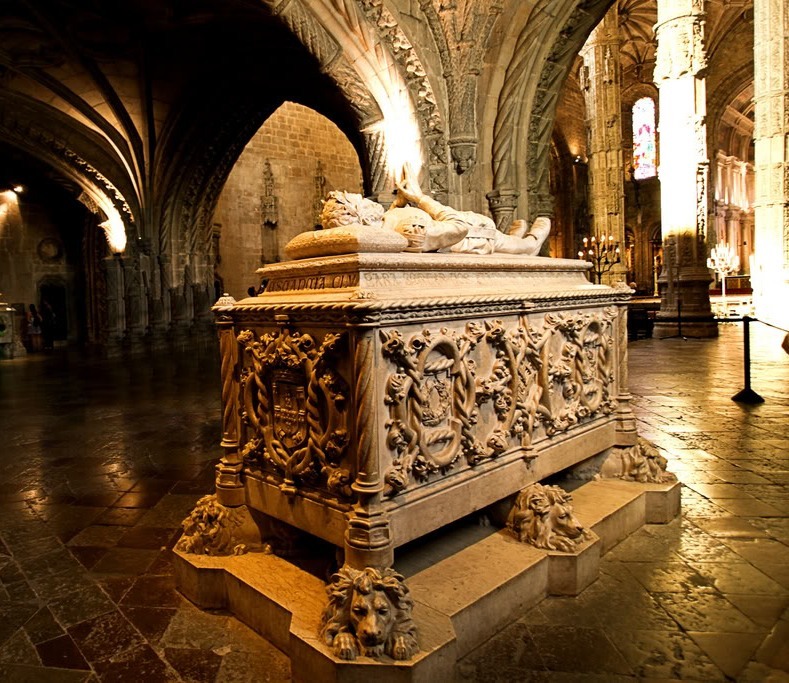 I’ve visted the tomb of Camoes twice now and never knew about this aspect (dying poor and alone) of his life. I’ve always wanted to read The Lusiades but I’ve heard it’s a difficult book to read unless you know your Portuguese history. You don’t need to know Portuguese history in order to enjoy or understand The Lusiads. I’d highly recommend the Landeg-White translation published by Oxford University Press. It includes an introduction and extensive notes.